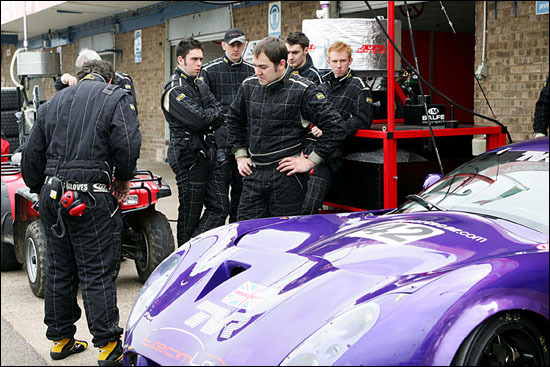 After the season opening run at the 12 Hours of Sebring, the British campaign for Team LNT got underway with a two hour race at Donington Park. Team LNT’s pair of FIA spec. 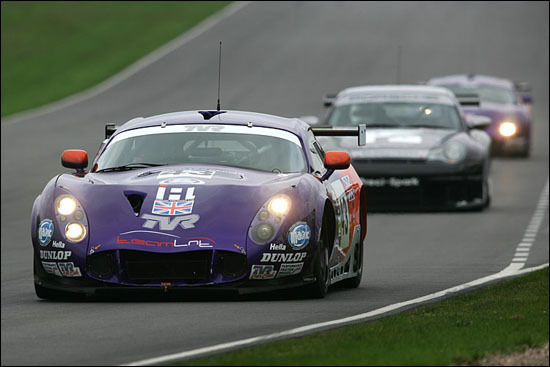 TVR T400-Rs are running in the full British GT Championship, while the pair of ACO spec. cars which will contest the LMES, beginning the European campaign at Spa on April 17. 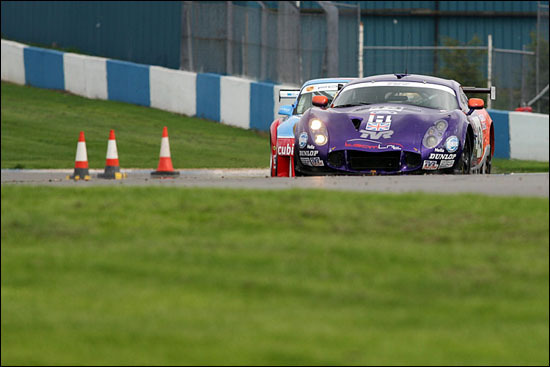 In the opening session of track action both LNT cars were in the thick of the action, with no mechanical dramas. Patrick Pearce in the #43 car topped the timesheets early on in the hour long session, which was interrupted twice by brief red flag periods to allow recovery of stranded cars. As the last quarter of an hour of the session approached, the pace hotted up considerably, with Andrew Kirkaldy leading the way in the very quick Scuderia Ecosse Ferrari 360 GTC. Behind him there was a chase on to close the gap. Warren Hughes, at the wheel of the #43 LNT car, and Jonny Kane in #42, were exchanging quicker and quicker times between them and, in doing so were climbing up the overall order. By the close of the session, Warren had grabbed the second fastest time overall (a lap in 1:08.738) with Jonnyin fourth slot with a 1:09.5. The early action in the half hour qualifying session was dominated by a Ferrari / Porsche tussle. 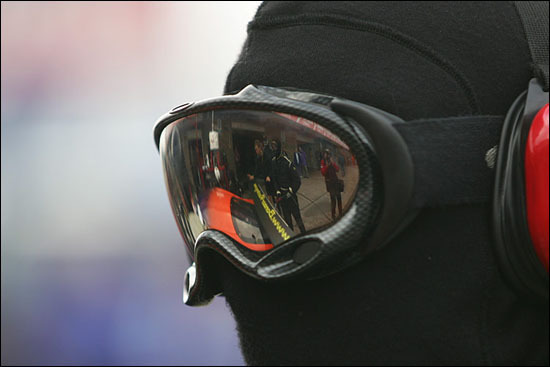 with some observers feeling that this would be the pattern for the season – they would be wrong! Both LNT immediately began to make an impact on the timesheets and, by the middle of the session, the TVRs were second and third in the order with Jonny Kane ahead of Warren Hughes, #43 ahead of #42, with just Kirkaldy’s very quick Ferrari ahead. Tim Mullen in the second Ferrari then edged ahead of the LNT pair and it was looking very much like a Ferrari 1-2 and TVR 3-4 as the session entered its last ten minutes. A wily old fox, ex-British GT and TVR Tuscan Challenge Champion and TVR factory Le Mans driver Mike Jordan, had other ideas. He pulled a lap time out of the hat right at the end of the session that had forced his “second best qualifying lap ever.” That’s a mark of the strength of the 2005 championship. So it was fourth and fifth on the grid for Sunday’s race for the LNT T400Rs: the team was confident though of a competitive race pace - a two hour race providing an altogether different challenge from the sprint to squeeze a hot qualifying lap out of the car and driver. It was a bright but breezy start to the opening race of the season, with 26 starters (11 in GT2) on the grid - considerable strength in depth for Team LNT to prove its worth. 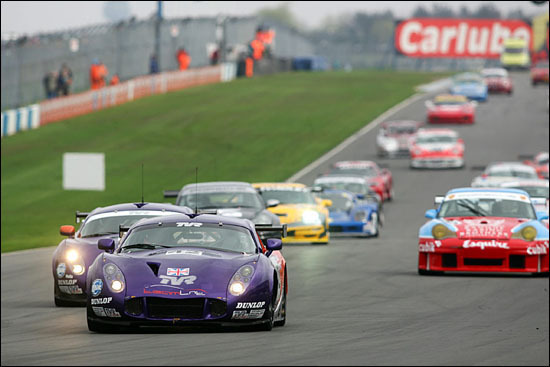 Series promoter Stephane Ratel offered the view that the British Championship entry provided the variety that even the jewel in the SRO crown, the FIA GT Championship, currently lacks in GT2. It was a fast but steady start from Patrick Pearce and Lawrence Tomlinson in #43 and #42 respectively, the pair initially leapfrogged by Ben Collins in the Embassy Racing Porsche - the first corner seeing a tussle between the two Scuderia Ecosse Ferraris and a pair of quick Porsches. The Ferrari provided a sense of déjà vu as Kirkaldy proceeded to pull clear from the chasing pack, which was busily engaged establishing a pecking order. Behind this initial melee, the Team LNT TVRs were charging along. With the lead Eurotech Porsche falling victim to a loose left rear wheel on lap 1, the TVRs were soon running fifth and sixth, Patrick Pearce in #43 harassing David Jones’s Porsche (and passing him within a couple of laps through the Craner Curves), Patrick running just ahead of the boss, Lawrence Tomlinson in the #42 car. It was the start of a hugely impressive stint from Pat, which would see him provide the only credible opposition to the leading Ferrari throughout the first half of the race. 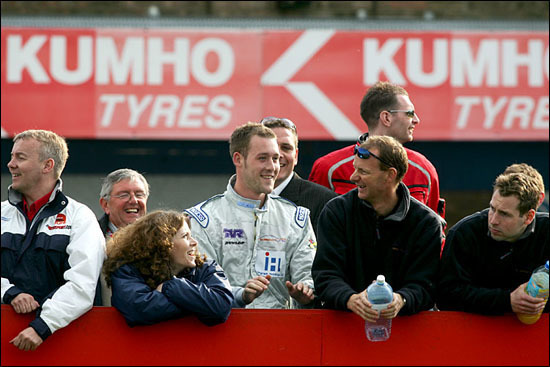 He was edging closer to Niarchos, while Lawrence was catching David Jones’ #22 Eurotech / Preci Spark Porsche. Just 10 minutes in and Kirkaldy was already eight seconds to the good ahead of the field, with seemingly only Collins and Pat Pearce looking likely to get into the hunt. 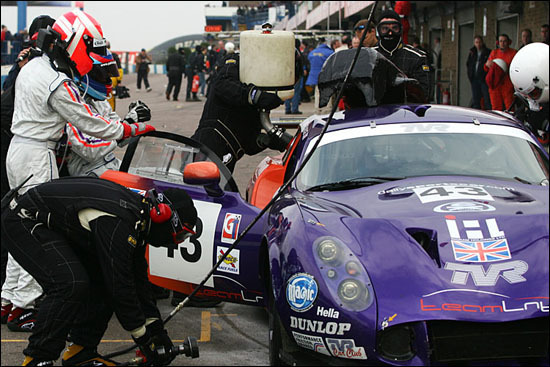 There was trouble though for the #42 TVR: a wisp of smoke from the rear grew steadily worse and all too soon, Lawrence Tomlinson pulled into the pits at the end of lap 12 - to a display of formation head shaking from Team LNT. The engine cover was removed to release a cloud of smoke. “It was a 30p oil seal,” Alan Mugglestone confirmed later: a promising run was over all too soon. There was good news for Team LNT at almost the same time, as Patrick Pearce’s efforts finally took him past Chris Niarchos for third place. Ben Collins was the next available target and Patrick was slicing into the Embassy Porsche’s advantage very quickly indeed. Catching another car is one thing, passing it is, of course, a totally different kettle of fish and Ben Collins was clearly determined to take a ‘firm but fair’ approach to the defence of his position. But Patrick was not to be denied, and after a lap of close attention the TVR man got a better run out of the Old Hairpin, was in a great attacking position through McLeans and finally made an excellent pass stick up the inside at Coppice. The remainder of the first half of the race would see Pat hammering along in pursuit of the leading Ferrari, but the 360 held the advantage here: the lead began to grow steadily despite Pat’s best efforts. He pitted to hand over the car to team-mate Warren Hughes, the car rejoining still in second place, with a substantial advantage over the chasing #34 Ferrari - but still well behind the #35 car, Nathan Kinch now at the wheel. So it was order restored, with Kinch’s task a clear one - hold off the TVR challenge for 55 minutes. The gap between first and second was now 50 seconds and Warren was tanking along in the #43 TVR – but the gap though would be far too much to claw back in the time available. The 1,2,3 order remained static for the remainder of the race, with the gaps narrowing (Warren carving 10 seconds out of the lead gap by the chequered flag). All in all a great display by Team LNT, with just an unfortunate minor component failure to take the sheen off the post race celebrations. 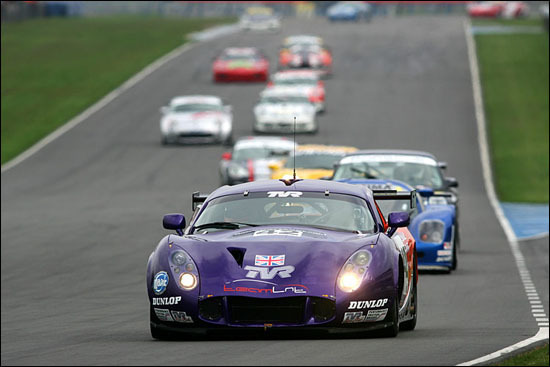 The T400Rs look set to be season long challengers, having seen off the best that the Porsche challengers could muster. Now it’s time to tame the Prancing Horses!